Although Oguz cooks so well, we often eat out sometimes because we don’t have time, sometimes because of laziness and sometimes just because we like discovering new tastes. We love eating out but I must confess, since I started living in my own house I realized that one of the benefits of eating out is that there are no problems like doing the dishes or cleaning the table. Whatever, let’s get to the point where this list came from. “Tat Dedektifi” (Detective of Taste) has been running an instagram account that I follow for a while now. He shares crucial infos like where to eat, what to eat, why to go somewhere or why not to go in generally İstanbul. Not only İstanbul though, he is one of those who would go miles for food. I did a lot of thinking on where to go after Oguz and I wanted to go out and I decided to get in contact with “tat dedektifi”: where should we eat, where should we have our breakfast, where should we drink our coffee? But then I thought to myself why would we keep this amazing source only to ourselves? I’m sure that everyone who likes eating a good meal in a nice place will love these suggestions. So, I leave you alone with the amazing list that “tat dedektifi” made for cizenbayan.com. Why Do I Love It? : It’s like I’ve gone to Adakara, everything comes from there. Tomatos, peppers, jam… Furthermore it has island’s bread made out of sourdough of Alishiro that’s become a social media phemenon itself and Oya’s nice chat. It’s the reason why I make island plans even in December. What’s To Like:Ali’s bread, Oya’s tomato sause and jam, because they’re in Bebek Steakhouse, its pastrami and sausage! Price Range: 50 TL per each. Note: They’ll be serving in İstanbul at the first and the last weekend of the month until may, they’ll return to the island in may, then we’ll go visit them there. Why Do I Love It? :They created a world in such a small place. Everything is simple but rich in detail. Where else Zile grape nolasses could be found in İstanbul? By the way it’s recommended to those, who haven’t tried it yet! Price Range: 25 TL – 50 TL per each. Note:Aheste is famous for being turned into a “meyhane” (traditional pub) in the evenings, it’s opening a new branch in Şişhane and the pub concept is going to be moved there. Galata branch will be serving only in the mornings and afternoons. Why Do I Love It? : Potential of thinking yourself in Trabzon, Maçka while you’re having breakfast in Beylerbeyi! Everywhere is so green, even you can’t see the sky in spring! What’s To Like: Kuymak, eggs with kavurma is above the average. Note: Place’s kitschness is trying to shadow its green, beauty of the pink tomatos that are collected from vegetable garden and sold right outside the door and its tastes. Why Do I Love It? : Chatting with the owners Agah and our friend Yosrie from Cape Town plus they serve the best croissant in town! What’s To Like: Their roasting style and beans, which become their signature are good but the real thing is their croissants. Turkey’s best croissant is to be found in Twins, even though they come frozen from France, until better can be made. Note: The milk they use is glass-bottled SEK milk, which I think its fat percentage has the perfect balance among all milks one of the kinds I like the most. Also, since the croissants are frozen, they warm it up in the owen when they serve it, which means you can have warm croissants any time of the day. And they opened a new branch in Karaköy! Why Do I Love It? :3rd wave is good but our people have Turkish Coffee culture they can’t let go of. I think Mandabatmaz is one of the best places that make Turkish Coffee. 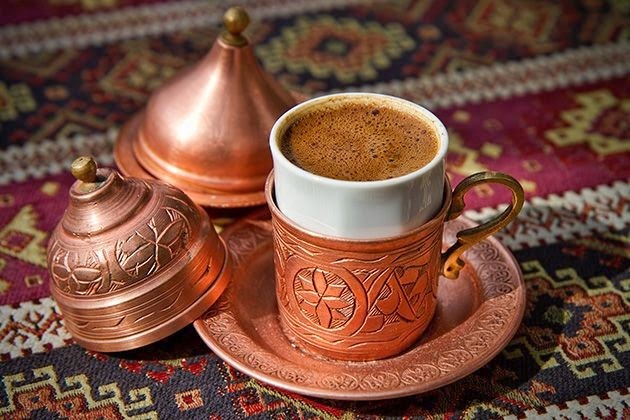 What’s To Like:Its Turkish coffee because of thickness and intensity of its scum. Why Do I Love It? : It breaks the certain perception of “vegan is not delicious”. What’s To Like: Mashed chickpeas with tahini, spaghetti with zucchini and vegan burger. Why Do I Love It? : Chef Murat who learned P of the pizza from the Italian chefs when Mezzaluna was opened, creates great things. Note: They do not give you a hard time by serving Suvla as wine, niiccceee. Why Do I Love It? : Its “lahmacun” is one of the best of Istanbul and you don’t have to go to Fatih for that. Please be headed to behind of Tesvikiye Mosque. What’s To Like: Lahmacun is the best. Note: Lahmacun is really good. The rest can be counted as nothing compared to it. Why Do I Love It? : The ultimate address in the madness of döner in İstanbul started by Bayramoğlu in Kavacık. What’s To Like: Its döner that you start with 100 grams and then find yourself ordering an additional 250 grams when you lose it. Price Range: 18 TL – 100 gr. Note: French fries which is served at first is cut by hand, YAY! They make “iskender” with the same döner and that döner is not suitable for “iskender” so I don’t suggest it. Why Do I Love It? : It’s so obvious that when it comes to meatballs, the kind that has a lot of water, is Balkan style, and smooth is counted as best in this country. And Bosnjak Mutfak is one the managements that do it well. What’s To Like: I say you go as group of 4 and try all kinds of meatballs. Pleskavica, Bosnak Meatball is my favourite. Definitely order “soka” beforehand. An amazing taste that’s born by the fermentation of milk and pepper in the ground. Note: Bosnian people make not only meatball but also “mantı” well. I say you try it but another bosnian restaurant, Sandzak in Pendik Marina makes mantı better. Why Do I Love It? :Its menu & names of the dishes referring to certain cities / districts of Turkey, table was opened in December 2014. It’s one of the few places I can guarantee you the quality of every dish. Note: There is yaka cheese of Mugla in the menu, it’s a unique experience for those who like their cheese strong, moldy, tough. Why Do I Love It? : It showed how assertive it is by being placed across the street of its biggest opponent in January 2015. In my opinion, it’s a nominee to be the best of the city. Note:It can be a nice alternative for Valentine’s Day and it’s good to make a reservation even for lunch. Why Do I Love It? :It’s a place where you can eat unique and delicious food for a reasonable prices in İstanbul. What’s To Like:Its spinnach salad with grilled pear (armut) that refers to the place Armutlu where it took its name from, Duck Liver Pate, Warm Mashed Chick-Peas with Beet, Lamb Chop, and Crunchy Baklava with Apple. Price Range: Their most expensive meal costs less than 50 TL, two people can have their meal including a glass of wine for 150 TL. Note: They don’t have a occasion for Valentine’s Day, it’s for those who want to eat in peace! Yazıyı paylaş "Amazing Suggestions From “Tat Dedektifi” (Detective of Taste)"